Farmers are known for enjoying a good sing-song. Emily Scaife explores the rise in rural choirs and the important role they have to play. The saying ‘everyone has a song in them’ appear to be true when you consider how many farmers and rural inhabitants choose to join a choir in their free time. And they’re not alone. The University of Oxford estimates 2.8 million Brits are now members of a choir, perhaps inspired by the likes of choirmaster Gareth Malone and programmes such as Britain’s Got Talent showcasing the collective efforts on prime time TV. In an age of social media and remote communication, the re-emergence of choirs is positive. From helping singers forge social bonds, to promoting beneficial physical side effects such as improved breathing, posture and providing a natural form of pain relief, many of those taking part report experiencing a high after a performance. In isolated areas, particularly for those in the farming industry, this stress relief and means of forging new friendships is welcome, as The Farmers and Farmers’ Wives Choir proudly advocate. The choir was established in 2013 specifically for the 75th anniversary celebrations of the Scottish Young Farmers Association (SAYFC). Kate Picken, a farmer’s wife and music teacher from Kirkcudbright, was approached to be the driving force behind the project. She says: “They were bringing together past and present members of YFC to take part in a concert. “I was contacted to see if I would start a choir similar to the Military Wives Choir. The project attracted 110 women and 45 men, who had just 12 weeks to get up to speed before their inaugural performance at Glasgow’s Hydro Arena. “People who enjoyed singing came from all over Scotland. There were no auditions, we just encouraged everyone to take part. Being part of the choir requires dedication. There are still more than 100 members and many have to travel as much as two and a half hours to attend rehearsals. But it’s something they are happy to do for the benefits the experience provides. “Everyone has a really close bond,” Kate says. “The choir gives everyone a boost in self-esteem and confidence. “It’s a great stress reliever and it provides a sense of community – people say we feel like one big family. Choir member Elspeth Dale is married to an agricultural lawyer and loves reconnecting with other former YFC members. “It’s a wonderful feeling to sing as part of a large choir,” she says. 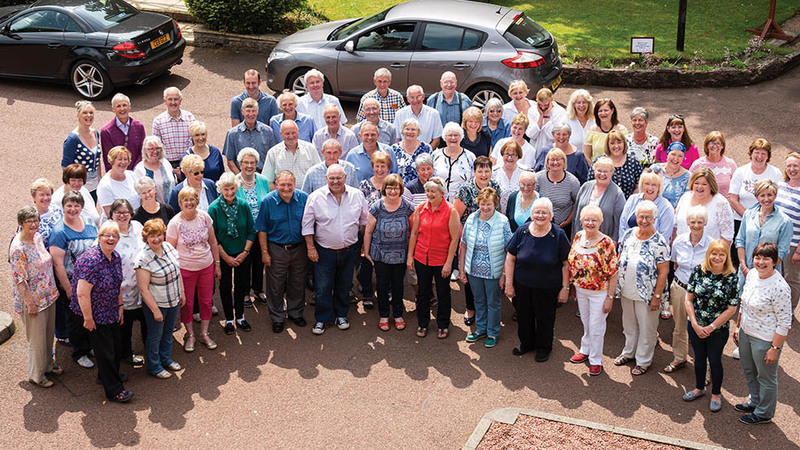 Janette Ball, from Ayr, agrees the sense of community within the choir is strong. “The choir has many benefits, including catching up with previous young farmer friends, meeting new and interesting people, hearing everyone’s news – good and bad – and being able to celebrate or sympathise,” she says. But the good work of the choir doesn’t just end at providing a sense of community and bringing friends together. The group have raised a large amount of money for charity over the past five years, for organisations such as The Royal Scottish Agricultural Benevolent Institution (RASBI) and Macmillan Cancer Support. The group also isn’t afraid to get political and shout about issues close to their heart, as evidenced by their recording of a music video in 2015 to help raise awareness of dairy farmers’ struggles. Entitled Milk Must Have a Future, the video, which has had nearly 58,000 views to date, was shot in a single day at Milton Farm, Kirkcudbright, to inform the public why it is so important the UK continues to support its dairy farmers. Member Fiona Haddow says this project is one of her favourite memories. “It is well known farming is a higher risk occupation for experiencing mental health problems and we want to send out a positive message of hope and encouragement, that it’s okay to not be okay and help is at hand,” Fiona says. Member Kelvin Frew joined the choir with his wife after a farming friend encouraged them to come along. Kelvin works as a mental health nurse and was proud to be part of this project in order to help raise awareness. “I have been very aware of the prevalence of mental health problems in the farming community,” he says. “One of the things I enjoy about the choir is that sense of comradeship and informal support that people offer each other. “Also, there is no doubt singing together is unifying and mentally and emotionally uplifting. Even when not in a particularly positive mood, I always leave rehearsals in a better frame of mind. “Hearing our song and seeing our video Carry You Home was just amazing.